I was asked to write a blog by The Guardian Sustainable Business section for World Food Day. I assumed many World Food Day blogs would focus on production, business, aid, farming, and global population stress in relation to food, so thought looking at the ‘last yard’ – or purchase choice – in developed countries would add a nice counter-point. And what better than to look at how information actually affects food choice. The article I put together uses a study to show how calorie numbers next to meal choices in short-order restaurants intended to help people make informed food choice, but in practice made no difference to behaviour at all. None. I the go on to show how the choice about food consumption is driven by the conflict between system 1 and system 2 thinking. (some say Type 1 and Type 2). 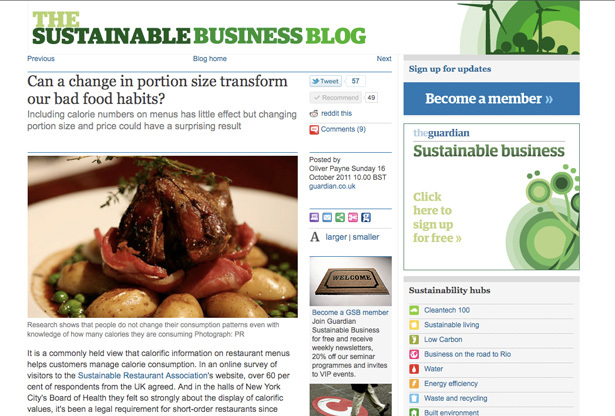 Have a read over at The Guardian Sustainable Business blog. Who’s the “we” that should apparently have more control over people’s eating habits than the people themselves? How about governments just accept that what people eat is none of their business, and that there’s no “correct” weight that everybody should be? “Problem” solved. And it’s a good point. The cause of confusion is mine: the ‘we need to find…’ referred to looking for a solution that genuinely allows people to reduce (or increase) their calories as evidenced by their behaviour, because calories numbers on menus did not allow people to increase or reduce their calories as evidenced by their behaviour (despite claiming they had been influenced). However, TurningTide drives at an interesting point applicable to the entire catalogue of cognitive-behavioural communications; Quis custodiet ipsos custodes, or ‘who guards the guards’. Certainly understanding out hidden quirks and judgmental bias can lead to covert manipulation of actions at the expense of constituents. The responsibility weighs heavy. The truth is we do eat what’s out in front of us, and perhaps I should have alluded to those experiments despite pressure to edit to fit the word-count. This link between vision and satiation is a psychological quirk proven by the ‘never-ending’ tomato soup bowl, where respondednts ate over thirty percent more in one sitting before declaring themselves full with a soup bowl that was linked to a larger hidden reservoir so it emptied less quickly than normal. [rightcol] The relationship between our stomach indicating satiation and our eyes telling us how much we’ve eaten falls in favor of what we see: Feeling ‘full’ is relative, not absolute. Indeed the entire article is about our assumptions at odds with reality, which is why the whole field of cognitive-behavioural communications exists. We must be careful. REDLAN1 comments that only a small proportion of our food comes from restaurants. …it’s not going to make much difference to obesity rates overall is it? How much of our food consumption comes from restaurants? This is true, so the critique that the solution I describe is a busted flush is correct in the narrow sense in which I illustrate the point. I don’t propose a direct read-across into other food choice architectures (how would you implement half-rice/half-price/full-price at home anyway? ), and I don’t have a meta method for using portion size choice ahead of eating outside of restaurants, but I do illustrate how making commitments for the future (which evokes System 2 thinking exclusively) avoids our imprecise and impulsive decisions made in-the-moment (run by our System 1 thinking which overrides System 2). Persianwar dislikes the broadly free-market/Capitalist notion that because the full-rice and half-rice portion options were chosen in a 60%-40% split when the half-rice portion was at half price *and* when the half-rice was at the full-rice price the restaurant owner might as well price the options at full price and take the extra revenue. The obvious solution of pro-rata pricing needs the owner to sacrifice some profit. Can’t have that can we – got to rip-off the customer. This opinion contrasting with a twitter user who critiqued the nature of psychological led menu presentation as nefarious and manipulative and ‘Commie pinko’ in nature. The desire from this reader was to ‘leave us alone’ to make free choice. Again, a vital and fundamental point, as there is no neutral, odourless, and colourless way to present choice; we are all choice architects whether we know, or like, it. The responsibility is heavy, and one we all have to bear. There are other comments based on the big levers of ingredients, manufacture, and all the things outside the control of cognitive-behavioural comms. Commantary from readers is interesting, informative, and very welcome. What do you think?